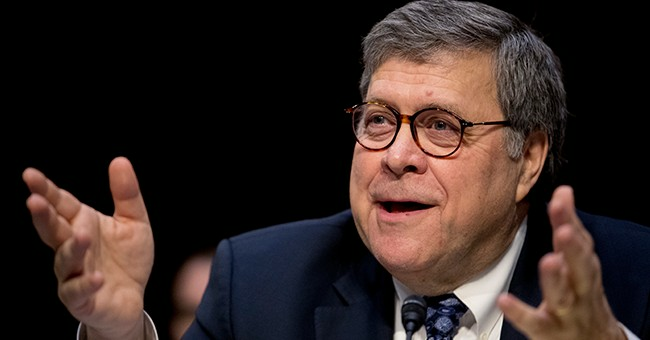 Speaking at the White House Friday afternoon, Attorney General Bill Barr explained his belief President Trump's national emergency declaration on border security is legal. "Mr. President, your declaration of an emergency on the southern border was clearly authorized under the law and consistent with past precedent," Barr said from the Oval Office. "The National Emergencies Act directly authorizes the President, and gives broad discretionary authority to the President, to identify and respond to emergent circumstances that require a decisive response. And the humanitarian and security crisis we have on the border right now is exactly the kind of emergency that Presidents are permitted to address under the National Emergencies Act." "In the past 40 years, there have been 59 emergencies declared. And many of these have dealt with political conditions in countries like Burundi, Sierra Leone, Belarus. The crisis that we're dealing with today is right on our doorstep, and it presents a real clear and present danger to the American people," he continued. "So what you've done from a legal standpoint is solidly grounded in law. And from the standpoint of protecting the American people, it's imperative." Barr's remarks came shortly before President Trump issued his first veto against a resolution passed by Republicans and Democrats in the House and Senate ending the national emergency. “Today I am vetoing this resolution. Congress has the freedom to pass this resolution and I have the duty to veto it," Trump said before issuing the veto. Meanwhile, House Speaker Nancy Pelosi is vowing to mount a veto override effort. The White House is confident she doesn't have the votes to successfully do so. Pelosi: On March 26, the House will once again act to protect our Constitution and our democracy from the President’s emergency declaration by holding a vote to override his veto. That vote will take place next week. The House is out of session this week.